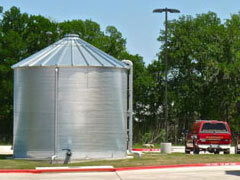 Mars corrugated steel tanks offer a reliable and durable solution for fire suppression. 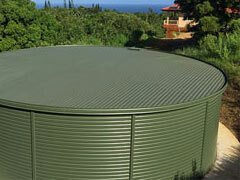 Water storage tanks come in a wide array of sizes and can be customized to meet your needs. Corrugated steel fire protection tanks range in size from 700 to over 600,000 gallons with custom options for larger sizes. Many accessory options are available, including Dual Use Configuration, custom liners, and steel fittings. All fire protection tank components must satisfy local fire codes. The corrugated steel tank dimensions chart shows standard sizes; however, we are happy to create custom water tanks to meet your fire suppression needs. Call our team at 1-772-646-0597 to discuss your requirements or request a quote. 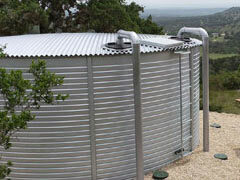 Mars corrugated steel tanks can be customized. 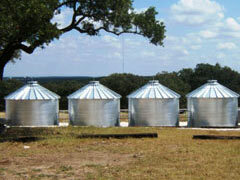 We will gladly build a custom water storage solution. Custom colors are also available on some flat top models, which provide an aesthetically pleasing design to blend into the environment. 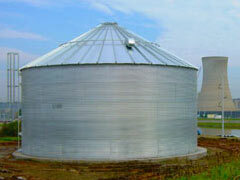 *Disclaimer: NFPA Code can restrict or change capacity considerations for usable volume with bulk water storage tanks. 10,000 15' 5" 7' 2"
15,000 19' 9" 7' 2"
29,000 26' 4" 7' 2"
40,000 30' 9" 7' 2"
50,000 35' 2" 7' 2"
65,000 39' 6" 7' 2"
100,000 39' 6" 10' 7"
Questions? Call our team at 1-772-646-0597.